The sun is shining, we haven’t had any new snow to speak of in more than a week, the birds are singing, dropping little fluffy nesting feathers, and the squirrels are playing chase instead of making a beeline from stash to hidey hole. 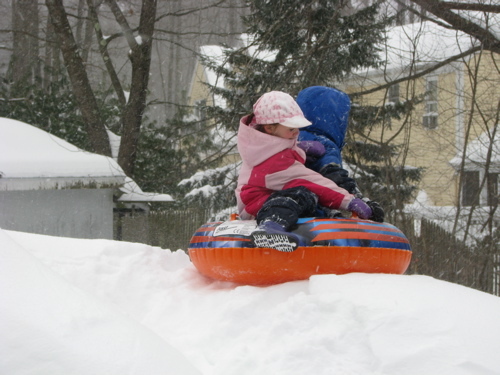 The snowblower-made sliding hill is still better than six feet tall and the snow in the yard can still swallow me thigh high in places but I’d like at least one more good dumping of fresh snow this season. It’s only February! Above is the “stream” that runs through the empty lot behind our house. Laughingly referred to as waterfront property by the neighbor who owns the lot. I tend to think of it as little more than a drainage ditch but it does run all summer long and it looks rather picturesque here, doesn’t it? Watermelon Valentines or should that be Valentine Watermelons? Who knew preparing for Valentine’s Day could be almost as hectic as Christmas? Between the boy and the girl we made thirty-plus valentines over the last two weeks. The girl was asked to bring in watermelon for a shared snack in her class today. She was already excited about that because she loves watermelon. 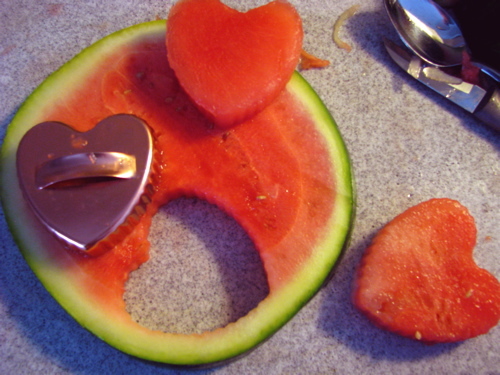 Halfway through slicing the rather small melon I wondered if I could somehow cut the quarters into heart shapes like I do with strawberries. No, but I could use a heart shaped cookie cutter! So simple, but I have once again upped my genius quotient with the girl. Yay, me. And really no waste as I just cut up the very small leftover to be eaten at home. These could easily make a whimsical but very grown up dessert with a small scoop of sorbet and perhaps a mint leaf or a few tiny berries for garnish. 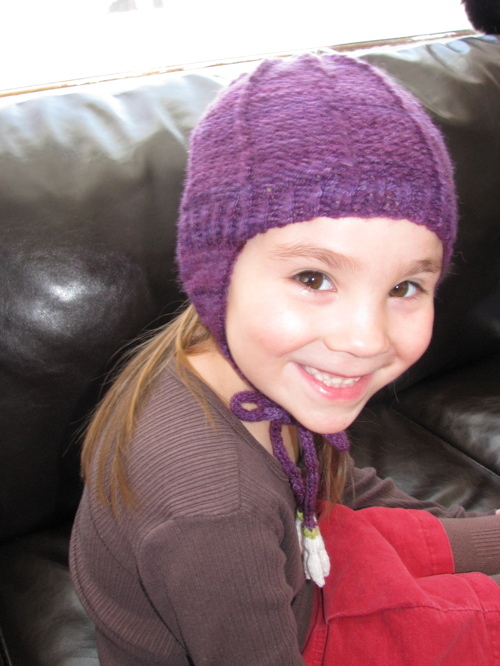 This is the hat I made from that PURPLE yarn. I am enamored with it. I’m usually relatively satisfied with the things I make but this one—this one makes me happy. I really, really like how this project (Ravelry link) turned out. Did I already say that? It probably has more mistakes than anything else I’ve knitted but I decided it was more important to keep on and finish it rather than get bogged down in fixing little mistakes and lose my momentum. I made a few minor modifications to the Monarch Lyon Hat by Veronica O’Neil. I used the sizing from another hat pattern by the same author. In the original pattern the earflaps are detachable using buttons but I decided that the girl did not need one more thing to lose since part of the reason I knit this hat is because she has already lost several hats and mittens this winter. 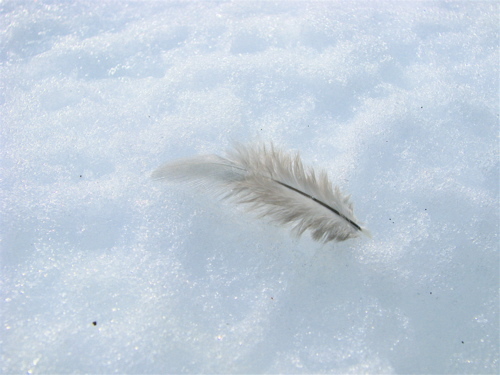 I’m wondering what we will find in the spring when the snow melts. 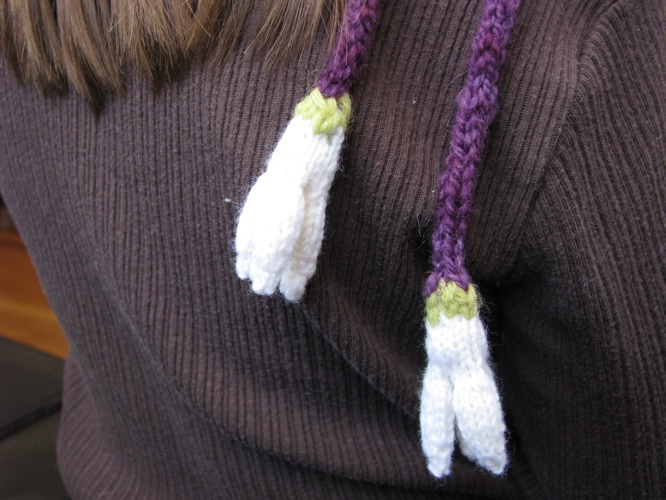 The main modification I made was to integrate knitted snowdrop flowers into the bottom of the i-cord ties. I chose snowdrop flowers since they are a delicate winter/early spring flower and they natural hang down in real life. I used a pattern by Lesley Stanfield from the book 100 Flowers to Knit and Crochet, although I was able to download it from the Lion Brand website for free. It was a bit fiddly but after trying several other flower patterns, this is the one I liked best. I think I’ll have to put this book on my wishlist, I like the variety and realistic look of the flowers in this book. The girl would probably prefer I put all 100 flowers on the same hat but she’ll have to live with my preference for simplicity for now. I guess she likes it, she graciously posed for a number of pictures. 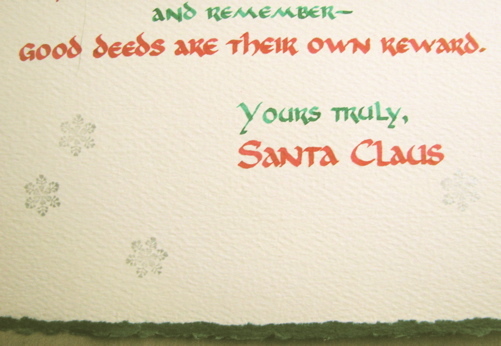 I recently answered an unusual request to create a hand-lettered message from Santa Claus. I know, you’d expect this in November or December, right? Me too. But the client had their reasons and provided the text. I used calligraphy pens with red and green inks, and a sprinkling of silver stamped snowflakes on a heavy cream-colored paper with a green deckle edge to enhance the old style Christmas mood. I used to do a fair bit of calligraphy when I was in high school and even college but most of my typography and lettering projects are done on the computer now with points and vectors rather than pens and brushes. I was a little apprehensive about how much time it would take me to complete the project given my rusty skills. I decided that a little digital preparation would not be amiss so I picked out a typeface reminiscent of Uncial script and set the type on the computer adjusting size, kerning, line spacing and justification exactly as I wanted it. I then printed this out and taped it to the back of the heavy paper and used the lightbox to letter directly over my computer-derived draft. It wasn’t tracing as I still drew the individual letters just as I would have if I didn’t have the guide underneath. But having the word placement and line spacing all worked out freed me to concentrate on the rhythm of the letterforms. It worked so well it almost felt like cheating. I doubt anyone but another graphic designer familiar with the particular typeface I used would possibly guess that I used a computer in the process. 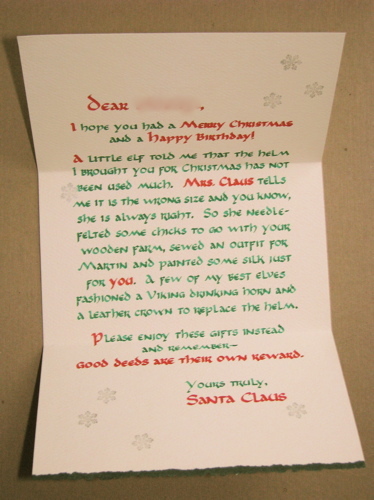 The final letter is hand-inked on classic paper stock, just as we might imagine Santa would write it himself. 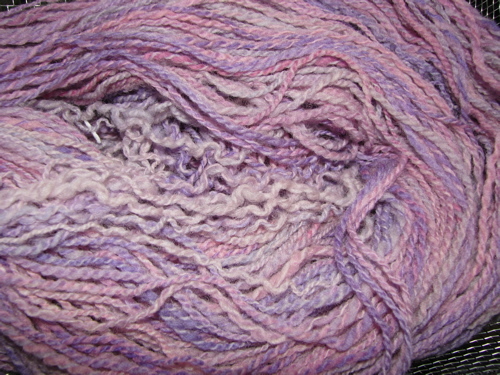 It began with the rather anemic looking light purple/pink handspun yarn above which has languished about the house for months, swatched and frogged more than once. The camera does lie, it looks worse in real life. 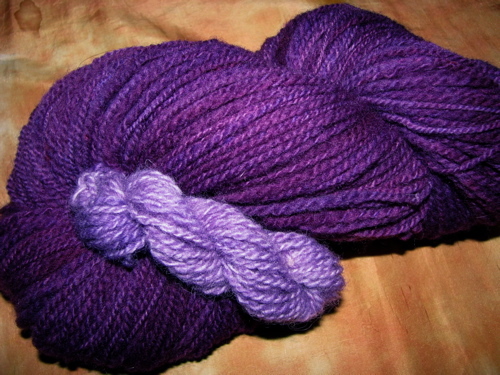 The yarn started as an even less inspiring roving I received in a trade. Apparently I neglected to take a picture of it then. No loss. 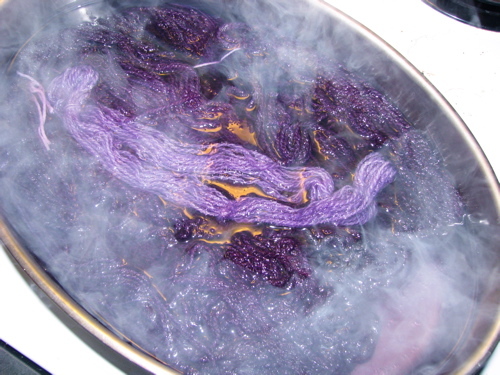 30 minutes simmering in the pot exhausted the completely haphazardly mixed purple dyebath. I did throw in a little mini-skein towards the end there, you can see it floating on top. A trip through the dryer in a net lingerie bag—I’m so impatient—and voila! This is yarn I want to knit! The kids went back to school today but I’m still recovering. 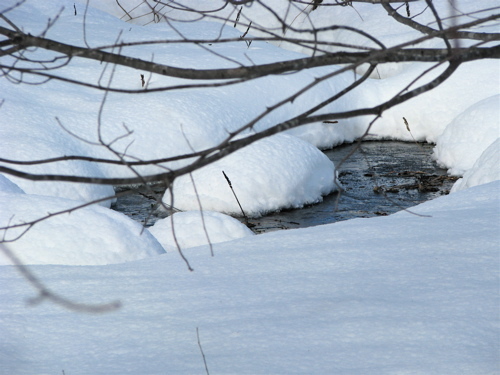 There are now two hats lost in the sea of snow. I guess I know what’s next in the knitting queue. Dad has created quite the little sledding hill at the end of the drive with the help of the snowblower. 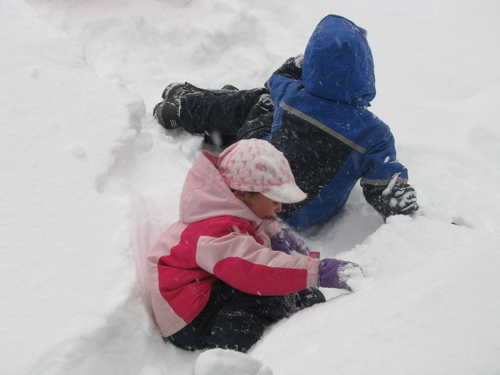 And the kids have packed two sides of the slide platform with snow to create a cozy little hideaway. 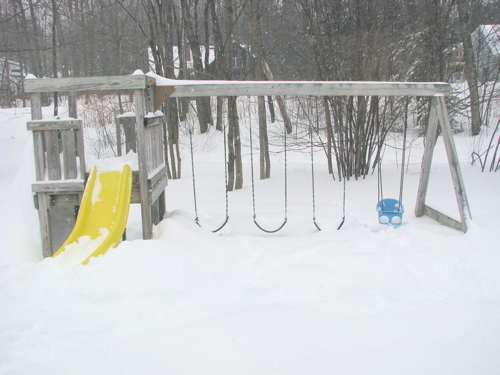 If you aim your sled just right you can shoot all the way into the dooryard of the fort sheltered by the turn in the slide. The “tube” is more likely to take you bouncing down into the deepest snow—maybe two feet including what came down in yesterday’s storm.